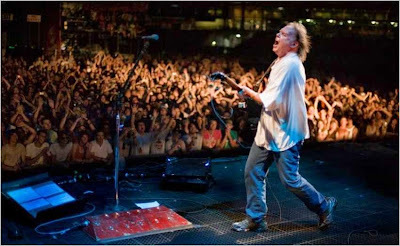 Although the volume of comments here on TW continues to decline, we still manage to receive some really passionate views on Neil Young and his musical influence. I am so proud to be a Neil Young fan in this modern era. Those who think the good times are all gone are way wrong, in my opinion. Lots of folks think the Status Quo is just fine. If only Neil would just keep remaking Harvest, etc. My politics line up with those of Mr. Young. The Mainstream Media and the Minds of Americans are not likely to notice a problem like massive doses of Poison in the food supply were it not for the courageous voices of famous artists like Neil Young. His rebellious vantage point and his hip girlfriend just add fuel to the fire of environmental righteousness he will lay out in this next dose of sonic brilliance. His latest wake up call to the sleeping populace. How did Americans get so Apolitical? The 60's are dead and gone. For most all, except for our hero, Neil, who carries the torch the present day. Each and every one of his modern releases contain masterful work. Take Fork in the Road, for instance. Johnny Magic and Fuel line are 2 of the hottest Rock songs any veteran has recorded in the last decade. If Don Henley could write and perform a song like Fuel Line, he would still be relevant. Yes, Psychedelic Pill was brilliant. So was Living With War. Who has the balls to call it like he sees it. He nails it. "Back in the days of 'Mission Accomplished…' " Cutting insight. "There's a Bailout coming but its not for you." Hello?! The Middle Class is being bled dry by this corruption. Are you paying attention? Neil is. Long Live Neil! How many more masterpieces can we get from the man? Be grateful he is so productive. Even Storytone is a classic album (I like the solo version best). There are some burned out Right Wing fans out there who wish Neil would shut up and do what they want him to do. Sorry, that's not how he works. Bring it on, Neil! Thanks Alan. Love that Neil passion and know the feeling. See you on the rail this summer. Maybe I'm a right winger but still the quality of his work continues to diminish. If he can pull a left wing masterpiece like Ohio where his words and music are top flight I'll listen to that all day long. Yes I love Harvest but I equally love the Ditch Trilogy and any Crazy Horse related album. I want Neil to be Neil but super excellent Neil where the words and music matter. To me there are no left right blue red Neil fans just Neil Young fans. I sure hope the new album is amazing but you have to worry. When he does a message or theme album it usually doesn't work as well as his normal pile-of-songs albums. I think the last two crazy horse discs a couple years ago were fantastic and greendale was great so I know he's still got it in him but on the other hand getting my science from a wacko like him is a little much even for a radical leftist progressive like myself. @ timothy - We were somewhat reluctant to actually post this comment because of the duality only perspective. @ John - well, this isn't looking like a pile-of-songs albums. You know, we liked Greendale & LWW as albums almost as much as we enjoyed the reaction of watching others going "wtf?". Any bets that Monsanto Years will bring about a little Neil dissing? If so, then we'll know we have another successful Neil album on our hands. For me, personally, I just never thought the day would come when I simply didn't care about a new Neil Young album. There are just so many of them lately, each of them worse than the one before it. The idiosyncratic 80s seem like a shining oasis compared to the dross he has dished up since 2000. It pains me to say these things, it really does. Why can't he just take some time to make a proper album? It was all very well to make 3 albums in one year in the 70s, because the quality of his writing was exponentially greater, then, than it is now. Now he just throws everything at the wall -- every half-baked thought that comes into his head -- and hopes something sticks. Trouble is, nothing is sticking. The last half decent albums were Prairie Wind and Living With War. Americana was passable. And now we have an entire album about Monsanto. I remember Neil saying in an interview in 1989: "I don't want to say how I feel about this or that, because then you come across as preachy, and you're a jerk." It's a shame that he's forgotten his own words. I still follow Neil and always will, but my passion has waned greatly. Neil has always been wildly inconsistent in both thought and action, but I actually think he's losing his integrity and credibility with these recent ridiculously simple, sloppy commentary concept albums. Playing armchair psychologist, as I've said before, I think it comes down to his ever increasing fear. Not just his fear for the planet or the future, but for his relevance. For the most part he's afraid to commit to truly working on an album because he fears it will be criticized, or worse yet, ignored. These immediate commentary throwaway albums are his way of saying how authentic he is and how sales and critics don't matter to him. In reality, I believe they now matter more to him than ever, but he can't face his increasing irrelevance. By releasing these largely one-take concepts, he's able to entirely hedge his bets. He can always say he just wants to get his thoughts out to the public as quickly as possible, but to me he's really saying he doesn't think he can do any better and doesn't want to have to face that reality. He is still an incredible musician as his live shows attest, but on record as a creative musically poetic songwriter, those days are likely regrettably gone. On a more positive note, he's already created a treasure trove of material for us to savor and digest as long as we all may run. 'Living w/War' was my last purchase, but i still love the musician ..... the artist who regularly tells you what he's thinking', whether you agree w/him or not. ...... Neil & Promise of the Real @ Red Rocks ..... yeah baby ! ... i may never buy a NY record again, but i will treasure every one of however many of the Man's performances i'm lucky enough to experience. .... enjoy the summer tour, folks... let the rest go, Neil don't mind. Here's the thing. Most artists don't have the balls to actually say what they think about Socio-Political and Environmental issues. They are afraid to become unpopular, get boycotted, and sell a lot less concert tickets or iTunes songs. Neil has an advantage in that he doesn't care about that stuff. Neil's "2 week" recording sessions have netted some pretty awesome results in the past and in the present. I love Mirror Ball, as an example of the 2 week album. A Letter Home had great material but horrible resolution. I ripped the "Clean" copy and it actually sounds great. The live versions of these songs were better still. The latest album has some very sweet songs on it. It also has some touching Goodbye songs on it, again, very autobiographical. Say Hello to Chicago could have come from the Bluenotes. Fork in the Road contains some great rockers and some keen insights. He called it when the Big Banks were getting rescued by… the Taxpayers. Light a Candle is a perfectly optimistic and beautiful song. Neil is speaking prophetically about a wide range of topics. He isn't happy about the Iraq war. He feels sorrow when he contemplates environmental destruction and the white people (still) stepping on the Natives. Le Noise was a brilliant masterpiece. I don't love it just because I have native blood in my veins, I love it for the truth it tells. It also F*cking ROCKS. Angry World is a fantastic song about… reality. The recordings for this tour prove Neil is still… The Gun. He is a one man band. Was Le Noise not great enough for you? Americana… This album Blazes. It is heavy hitting. This is RITFW blowing up the old folk standards and a classic cover of S.Stills' High Flying Bird. The album is strong. And Neil contemplates mortality. He is growing up and growing old. Psychedelic Pill is fantastically powerful. It also is Neil writing his autobiography to music, Epic lengthy passages with soaring, inspired guitar. Old Black cracks open the Heavens and Reigns Glory, again. Ramada Inn. Walk Like A Giant. And some very catchy little ditties: Ontario and Twisted Road. In the end, your flagging satisfaction with Neil Young may say more about you than about Neil's output or level of quality. Have your Testosterone level checked. How's your "Backbone" ? I am SO looking forward to The Monsanto Years album. I am praying he tours to Seattle or within range. What am I up to? Well, lets see, my family is raising organic chickens for eggs, growing an organic garden, just got my rain barrels set up due to the drought in WA state, now joining the dry Southwest in dryness in the New Weather. Oh, and this Saturday, May 23rd, I am Marching Against Monsanto in downtown Seattle again. Last year was great. Are any of you engaged in the modern threat to our food supply posed by incredibly large amounts of poison being sprayed on it? GMO defenders like to think of things like hybridization… they fail to see the point that the company just wants to sell more poison to spray on the food supply. The level of poison, in hundreds of millions of gallons, is a HUGE increase. There is evidence that herbicides (Rounup) cause Autism and a host of other health ailments, like Non-Hodgekin's Lymphoma. Monsanto is not trying to FEED the World, it is trying to make food that won't reseed itself so all the countries are forced to buy seed from… Monsanto. Wake up, y'all. Any Global Warming Deniers trying to listen to Neil Young's new albums? It must get tiresome hearing new anthems like "Who's Gonna Stand Up?" when you can't embrace the concept. Any of you all heard that new live song "Stand in the Light of Love" yet? That is a great song. Long Live Neil Young. Keep putting out your albums. It has been a pleasure to take the journey with you. Great Spirit, Neil Young still has much work left to do on this dying planet. Let us have him for some more years. Thank you. Alan in Seattle. I agree with this positive reaction.I don'like people that write Neil off.Not every record is his best,but it's at least different.I really appriciate what Neil's doing and I hope he comes to the Netherlands again one day. Alan, I largely agree with your sentiments. The passion and dis-passion of a Neil fan both come from a place of love and respect. For me, the newer/newest Neil stuff is just way too literal and "unprofessional" sounding. A little more craft after the initial inspiration would yield great results in my opinion, but that doesn't appear to be his desire at this juncture. "Just because it's over for you, don't mean it's over for me. It's a victory for the heart every time the music starts, so please don't kill the machine"
RARE: Neil Young - "Time Off For Good Behavior"